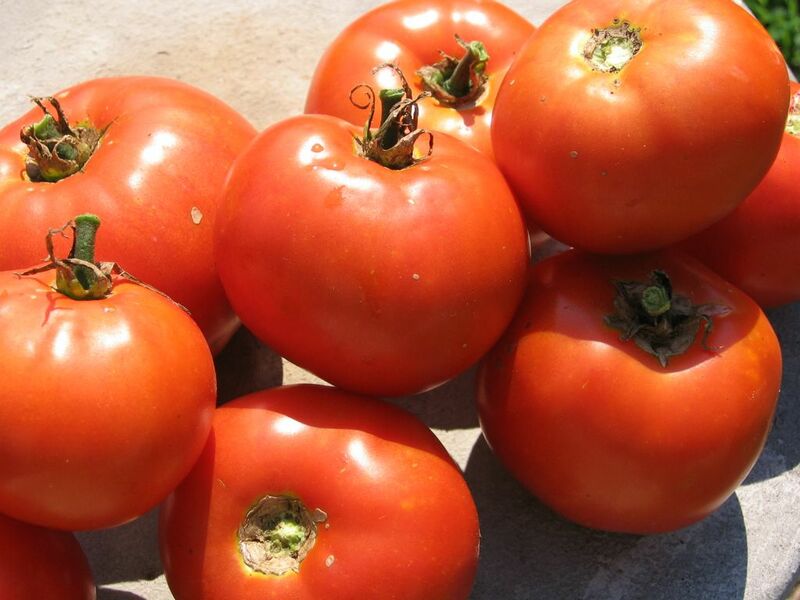 Farmgirl Fare: What To Do with Too Many Tomatoes? Grab the Blender! What To Do with Too Many Tomatoes? Grab the Blender! Gorgeous bounty from the kitchen garden—and lots of it. In the past 48 hours, not only have I been unable to come up with an interesting little story to go along with this new recipe, or figure out a nice way to photograph it, I can't even think of a decent name for it. If I call one more creation 'Susan's Super Simple Summer Something,' people are going to start thinking there's something wrong with me. And the other day I did start thinking something was wrong with me. I kinda sorta almost started getting tired of eating tomatoes. At first this didn't seem possible. After all those months of patiently yearning—not to mention all that sheep manure fertilizer I hauled up to the garden—had my child-like thrill over that first ripe tomato already given way to the glutton's nonchalance? Then I realized that I've already been enjoying ripe tomatoes from the garden for six weeks now. Six weeks of pretty much getting all of my 5 to 9 daily servings of fruit and vegetables from tomatoes. And then I didn't feel so bad anymore. But I still had a problem. Everywhere I turned in the kitchen I saw ripe tomatoes in desperate need of being dealt with. And while the rest of the world apparently gathers up all of their imperfect, overripe, questionable looking tomatoes and roasts them—and while I love the deep flavor of roasted tomatoes—turning on the oven for 8 straight hours in August to cook up anything is never gonna happen in my kitchen. So I threw them in the blender instead. And I created yet another super simple summer recipe. That I can't come up with a name for. Fortunately (while I was slurping it up with a spoon)* I did manage to come up with several ways to use this sublime stuff. The most obvious is to pour it over pretty much any kind of salad you feel like tossing together (including my Colors Of Summer Salad). Or you could drizzle it over a platter of sliced tomatoes and mozzarella that you've garnished with fresh basil sprigs. I think it would be fantastic in a chilled pasta salad. If you happen to feel like turning on the oven for a much more reasonable one hour, you could whip up some homemade pita breads, stuff them with fresh baby spinach and other veggies and perhaps a few chunks of cheese, pour on a little dressing, and eat your salad as a sandwich. Or you could have warm pitas filled with some nice cooked Italian sausage, slices of roasted red pepper, a few chopped tomatoes, and topped with a splash of dressing. You could use it to liven up deviled eggs or egg salad or even chicken salad. Make it thick and use it as a dip for slices of crunchy sweet peppers, carrot sticks, or hunks of raw cauliflower. I think you get the idea. I just can't believe that with all the cute critters and crazy goings-on around here I wasn't able to come up with a better excuse for my lack of creativity in the naming department than the stupid heat. Maybe there really is something wrong with me. Oh well. At least I'm still eating my tomatoes. Spoon the sour cream into a blender. Toss in as many halved or quartered tomatoes as you like, cutting away any questionable looking spots if you're dealing with overripe or imperfect bounty. The more tomatoes, the thinner the dressing; meaty, plum tomatoes will give you a thicker end result than regular "salad" or "slicing" tomatoes. Add a few large spoonfuls of pesto. Whirl it all up in the blender, then turn it off and take a little taste. Add more tomatoes and/or pesto if desired. Sprinkle in some salt if needed. Whirl once more and enjoy however you like. —Use thick Greek yogurt or yogurt cheese in place of some or all of the sour cream or yogurt if you want a thicker, dip-like consistency. —Use arugula pesto instead of basil pesto. September 2007 update: This recipe inspired the High Kicking Tomato Dressing I put on my Mexican Jumping Bean Slaw, which also makes great vegetarian tacos. * I know, I know, I tend to do that a lot. In fact, I've consumed quite a number of meals standing in the kitchen, wielding a large spoon. Just the other night I had pesto for dinner. Not pesto pasta, not pesto pizza, just pesto. Straight out of the food processor. It was really quite tasty. It's not my fault, though. I inherited an incredibly vigorous taste-testing gene from my mother. You should see us with a bowl of cookie batter. © FarmgirlFare.com, the well fertilized foodie farm blog where Farmgirl Susan shares stories & photos of her crazy country life on 240 remote Missouri acres. Totally, TOTALLY, slurp it up with a spoon! Oh! Oh! How about over a baked potato? We often eat potatoes for lunch with chopped, steamed broccoli, melted cheese, and roasted red pepper sauce on top. I think this would be a delicious alternative to the pepper sauce. Ah, that I were to live but down the lane from thee and could walz by and taketh some of those delectable looking fruits off of your hands... I do so love homegrown tomatoes. Can it ever be too hot for tomatoes? Or perhaps our problem is that it is too dry here in the state of Texas? 1) Do the oven overnight. It's low heat. 2) Try my recipe, which takes much less time. I call them "Godiva Tomatoes." I used to can tomatoe juice to make soup with all winter long, it's the best! ... but just in case: it's possible simply to put the tomatoes in zip bags and freeze them. Whenever you need some fresh tomato flavor in no-fresh-tomato-anywhere time, they can easily be peeled by shortly splashing the still frozen tomatoes with hot water. we went to france for 2 weeks in our d.i.y. campervan, first gathering up and taking with us all the ripe tomatoes our allotment had to offer! so many of them!!! containers full! we survived on tomatoes for over a week, across the length and width of france, even giving them away to the helpful lady in the tourist office! and now we're back, yet more have grown! yum!!! enjoy them! and thanks for the cooking ideas! MMMMM, tomatoes.... mine are only just starting to ripen because we live so far north and because (gulp) I planted late this year. I recommend when you go on your next fried pie expedition (I mean auction) you look for a toaster oven. I run a long extension cord from the house in the summer and do my tomato roasting outside. Tossing some roasted tomatoes, pasta, pesto and feta cheese together in the summer is FAB. But I'll definately be trying your 7 second solution too! It't that time of year, too many tomatoes. Here in NM it is time to freeze green chiles so I just don't have room for too many other veggies. I have given them away to my neighbors, the local senior citizens and we have them every evening no matter what else. I put them on pizza, pasta, baked potato, pestos, but still...too many, yipes! Thanks, Farmgirl for brightening my day! last year I had some tomato sorbet, and it was the most delicious thing I could imagine having on a hot summer day. They served it with a sweet balsamic vinegar and bits of basil I think. I think some tomato canning is called for...Then you could save them for pasta sauce, or chili on those cold, frosty winter nights..and give some jars as gifts! I'll forward my home addy to ya! LOL! So yogurt cheese is basically yogurt that has been drained for another 24 hours or so??? Could I just use cheesecloth? Yogurt cheese??? How in the world did I ever forget about yogurt cheese? Goodness I need to get back in my own kitchen... and thanks for the idea I did come in to find a use for my glut of tomatoes.